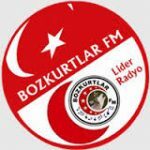 Bozkurtlar FM live broadcasting from Turkey. They broadcast various kind of Turkish Music. Voice of the Turkish nationalists, Us Anywhere Turkestan “and slogans can be heard via internet broadcast live. In line with the requests, live broadcasts that coincide in many of nationalist Turkish radio and serves some of the most important artists of the world. Bozkurtlar FM is one of the most famous online radio station on Turkey.